I figured it was only fair that since I gave my own version of how things went on New Year’s for us humans, that I should also give an account of how New Year’s went for the dogs. I can say right now that it wasn’t at all pleasant for them… And honestly in hindsight, we probably should have given them all a Valium New Year’s Eve. We all know how sensitive dogs ears are and even though the festivities were going on in town, about a kilometer from where we are, it didn’t make any sort of difference to them as they still heard all the activity as if it was going on in their enclosures. And they made sure to let us know the following day how upset they had been… But I’m getting ahead. The day started as normal, wake, drink water, eat some kibble, nap time, bark at some people walking by, nap time, get up and stretch, nap time, potty break, nap time, join in on a walk with the sanctuary dogs, nap time, play time, water, nap, dinner. For the dogs in the sanctuary, that was the end of their day. For the four porch dogs, they joined us for our walk over to Sai and Charlie’s place. They had to stay outside however since they have their own dogs. When we finished dinner, none of the dogs were waiting for us which was very unusual. As we walked past our house on the way to town only two dogs, Noodles and Balua were on the porch. Balua already looked freaked out by the distant booms going on around town so we put him in my room, which I share with a long-term volunteer. We left the door open a bit to give Noodles the option to go in if he chose to later and headed to town. Piglet and Nipper were nowhere to be found. They are street dogs after all, so while there was concern for them, especially with it being New Year’s, we figured they would make their way back. Once myself and the other volunteer came back to the house after the town festivities, we found Balua still in my room curled in a corner. He had somehow managed to wedge himself under my backpack and even stranger had clothes piled on him too… No idea how he did that! Noodles had also let himself in and was standing in the center of the room waiting to be let out. Piglet and Nipper were still MIA. About an hour later Piglet showed back up. Then the rest of the volunteers showed up to continue to party at the house. The next day Nipper was still missing. The dogs in the sanctuary had clearly not had a good and restful night sleep as fight after fight broke out with just about every dog involved in one and another. Preparing and serving breakfast was the hardest task of the day since most of the time was spent breaking up one fight or another. To try to settle the dogs, kibble was given in grand mass. We probably overfed every dog, but it at least calmed them down and distracted them enough to stop their fights for a half hour or so. As the day progressed, the tensions were still high. You could literally just feel it in the air and practically cut it with a knife. I can’t say I blame the dogs for their behaviors. But I will say it was one of the toughest days working in the sanctuary! It’s literally taken about 3 days to get the dogs back into a regular routine and feeling calm again. Poor puppies!!! Nipper didn’t even come back on New Year’s Day. He returned the 2nd with a bit of a limp in his right front leg… Lord knows what he got into or where he was for almost 36 hours. I’m just glad he made it back with only a minor limp!! New Year’s Eve day started as it normally does as a volunteer at the Thai Animal Sanctuary: feed dogs, clean enclosures, medicate/change bandages, walks, play time, shuffle dogs around, lunch, finish whatever daily project that was scheduled, night feeding, workout, shower, dinner time! Instead of having to prepare our own meal for dinner however, we were invited to Sai and Charlie’s place to dine for New Year’s. 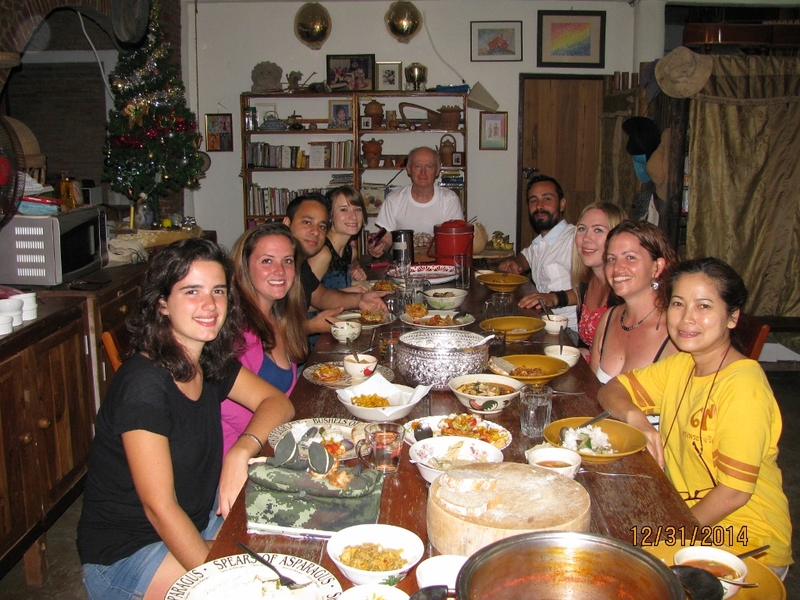 Sai and Charlie, a Thai-British couple, are one of the many gems in Sangkhlaburi. Just about every morning they drop off a dish of rice and chicken, with bits of egg in a chicken broth so we can mix a bit into the morning bowls for each dog. For Christmas they made a huge vat of a similar soup with the added bonus of veggies for all 60 dogs in the shelter. They made so much that each dog had their own large bowl of Christmas breakfast, instead of just a bit mixed in with their normal kibble. We stayed a couple hours then headed into town to the school soccer stadium for the muay thai kickboxing competition. All I had anticipated was just that: a ring set up for Muay Thai. What we walked into was so much more! It was seriously like a full on carnival or circus (minus the animals)! Neon lights lit up the stadium in every direction along with tent after tent selling food, clothing, fried insects, flip-flops, underwear… You name it, they just about had it! As we had arrived a bit late for the start of the muay thai kickboxing we were only able to see a couple of fight rounds. The competition was going on for 5 nights (New Year’s Eve being the second night) and each night featured a different age group. New Year’s Eve night was for the youngsters (they looked only about 6 years old!!) to the teens. I can’t tell you how impressive the fights were! First were the teen boys who wailed and kicked and punched eachother until a brow was split open and after only 2 rounds the fight was called. Next up were the little kids whose heads didn’t even make it up to the top portion of the ring!! Before each fight the competitors walk around the ring with a little hop in their step, kinda like a little dance, to each corner and bow. Next they go to their corner and have their headdress removed and are rubbed down with deep heat oil, which is sort of a liniment oil to slick their skin making it harder for their opponent to get a good grip. Then the fight is on! Those little kids wailed and kicked and fought their little hearts out! When the bell rang to signify the end of the round, their coaches would come in and sweep them up into a bear hug and gently shake them up and down. It seriously looked like they were getting a nice cuddle after each round, but really what the “hug” was all about was to help stretch their spines. Then they got a very thourough rub down with cold water, had their arms and legs stretched out a bit, then off again to fight. The boys lasted through 5 full rounds until a winner was called. So impressive! The kids fight was the last for the night, so we wandered the rest of the field checking out the various tents and their goods for sale, then headed to the other stage set up on the field. We hung out watching traditional lanterns light up and float into the sky, decorating the night with extra stars, and the various traditional Thai dancers up on stage. The hours passed with drinks in hand, the company of good friends and the entertainment all around. Then about 10 minutes to midnight the Mayor of the town got on stage to give a speech. Of course it was lost on all of us, but it sounded like it could have been interesting. About 7 minutes to midnight a bottle rocket from the stage shot straight over our heads directly to another stage area where it struck and lit up a huge firework display! I’m not going to lie, I was kinda freaked out by the bottle rocket launching above us because at first I thought it was rogue. But once I realized it was actually a planned launch, all was well. The first firework display went on and on showering the earth with white sparks. In the center glittered what I assume to be “Happy New Year” in Thai. Once the first display started to peter out, the next display was shot off. Hundreds of brilliant fireworks shot into the sky with every color possible! I was mesmorized by the show of lights and the glitter of the lanterns still dotting the night sky behind them. We were so close to where the action was that the ash from the fireworks rained down on us, sometimes even getting in our eyes and gawking mouths, lol!! I was just in absolute awe. It was one of the most impressive New Years displays I’ve seen in a while. Especially considering how small this town really is, it was just awesome! Knowing we had 60 dogs to feed the next day, I opted to head home to sleep (after a brief impromptu game of football using a balled up jacket as a football much to the amusement of the Thais) while the rest of the gang (minus one volunteer) proceeded to get hammered once we got back to the volunteer house. Needless to say myself and the volunteer who didn’t drink were up bright and early while the other 5 volunteers weren’t even able to get out of bed until about 3pm New Year’s Day, and even then were useless because of their hangovers, lol!! For once I was actually glad I wasn’t the one who was drinking, lol! !